Suffice to say... pretty tedious day, but at least.. the Yellen is out of the way until the next FOMC meeting of March'18th. Until we break under sp'2100, there still isn't any clarity that a moderate retrace is underway. If <2100, then target zone is 2065/50 within the next 2 weeks... that might equate to VIX maxing out in the 18/19s. US equities have turned a touch weak, having broken new historic highs a little earlier. Market is being lead lower by AAPL, having got stuck against the upper rising trend. Metals are holding minor gains, Gold +$3. Oil has built rather powerful gains of 3.7%, but is broadly flat on the week. *I refer anyone to the 'fair value stocks' post on AAPL I did yesterday evening. 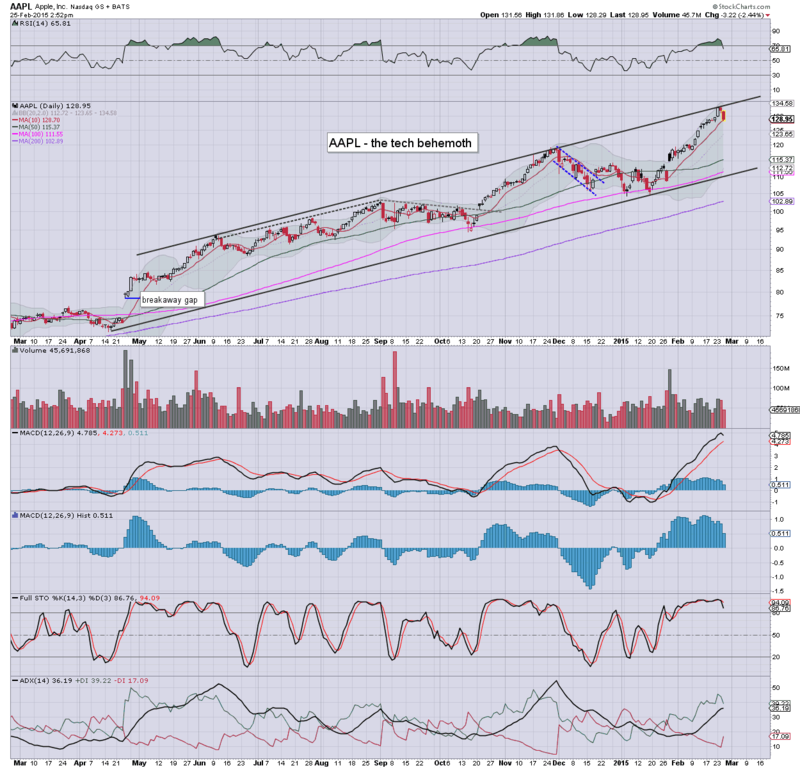 I am certainly broadly bullish on AAPL, but its natural for a pull back to the 125/20 zone. 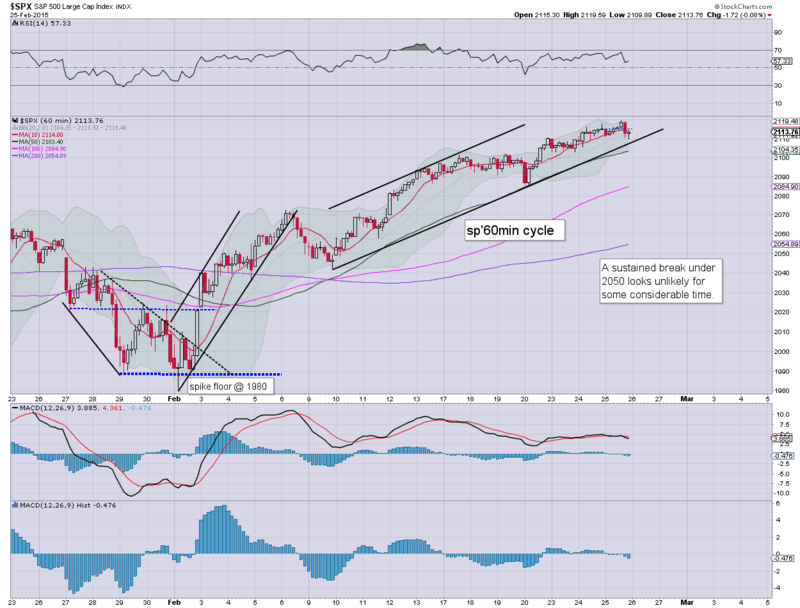 The latter would likely equate to sp'2060/50s in early March. So... was sp'2119 a short term high? Until we break <2100... difficult to say. Regardless, were I only looking at the AAPL, INTC, and HD charts, I'd say a minor correction is underway.. even on a day when the indexes have broken new highs. 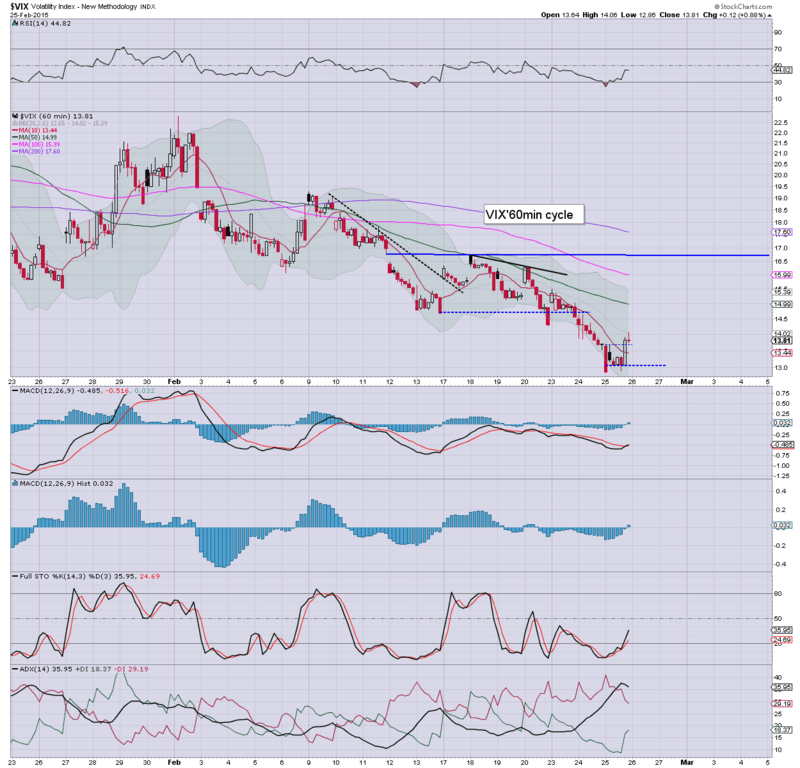 *it is also notable that the VIX has turned positive, swinging from 12.86 to 13.90s. 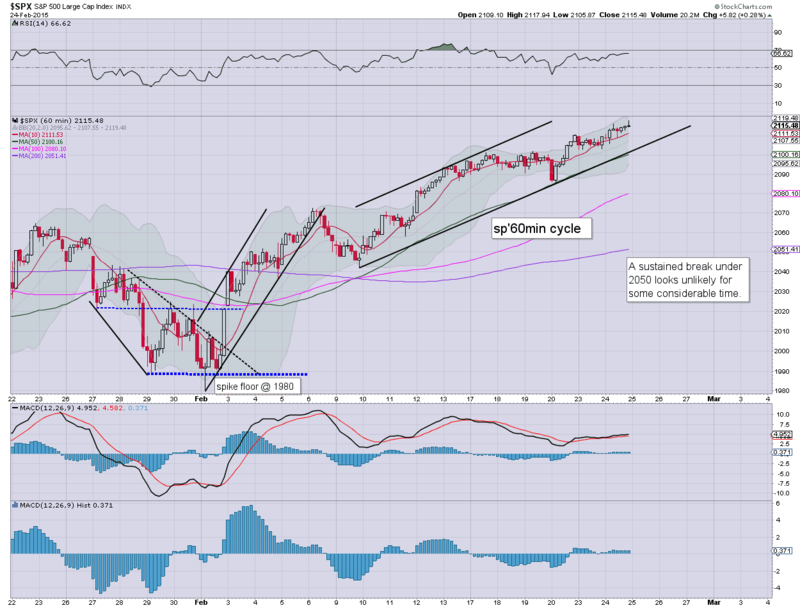 A daily close in the 14s would offer initial confirmation of an equity cycle top. updates into the close... not least if we continue to slip lower. 3.04pm... Ohh the humanity.. the Nasdaq might actually close red for the first time in 11 days. Notable weakness: AA -5%.... carnage in the aluminium stocks. 3.12pm.. minor chop... but for now... a red close looks due.... being confirmed via VIX. 3.23pm First soft support on the hourly sp'2105/03.... things really only see some clarity once <2100. Notable weakness: airlines, UAL/DAL, both lower by around -2.5%... as Oil prices climb. 3.38pm... a little chop... but still weak. A red Nasdaq close.... would be clearly a concern... do we move to crash alert yet? 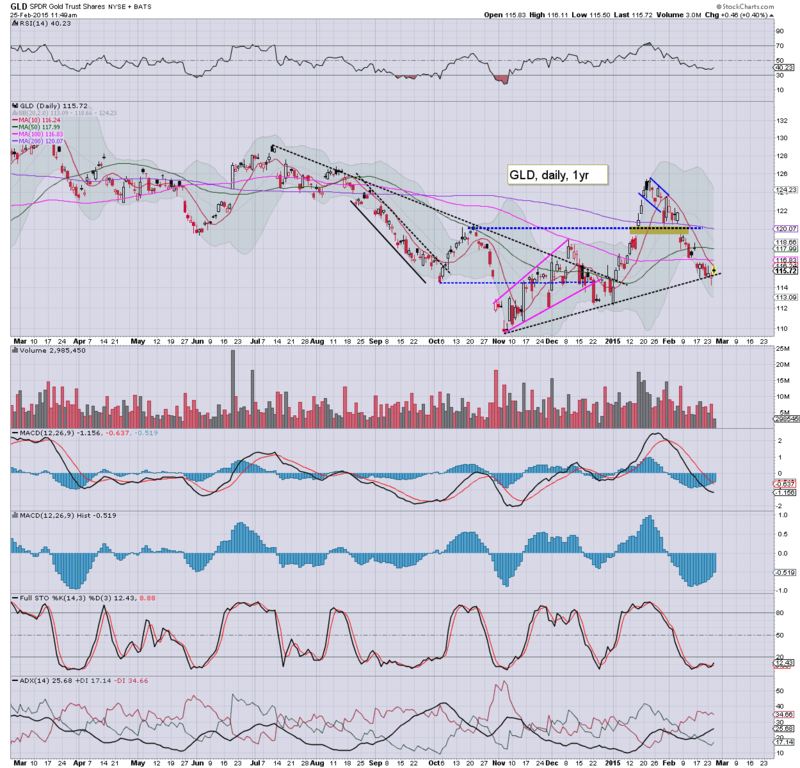 Notable weakness: AAPL -2.8%.. seemingly headed for the low 120s. Seen on the bigger daily cycle, it remains algo-bot melt mode. First key support remains the daily 10MA.... which itself is rising very fast. 2.32pm.. typical turn time... market appears to want to turn red..... lead lower by AAPL, INTC, and even HD. 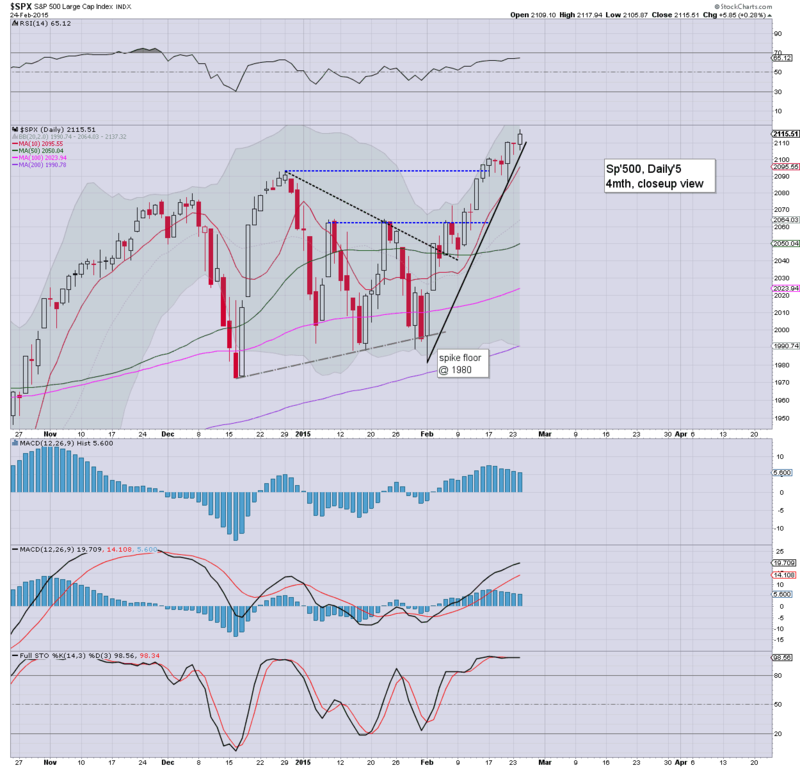 US equities are in nano chop mode, with marginal new highs for some indexes. The Nasdaq comp' is higher for the 11th consecutive day... a mere 0.5% from hitting the giant 5k threshold. Metals are holding minor gains, Gold +$5. Oil has re-built gains of a somewhat significant 1.4%. Aside from a few dynamic movers like HPQ and CHK.. it is simply another day of tedious algo-bot melt... to the upside. As the Yellen continues to answer questions from intellectual giants such as Maxine Waters, the equity market remains in micro chop mode.. with some indexes already turning back positive. Gold is +$3.. but looks particularly weak. Oil is similarly weak, +0.1%... set to turn negative. *the questioning from Waters remains utter train wreck TV. I'm fuzzy on exactly what district of the USA she is representing.. but really... I can only imagine what Yellen is thinking at times of those who question her. CHK -11.4% on lousy earnings. 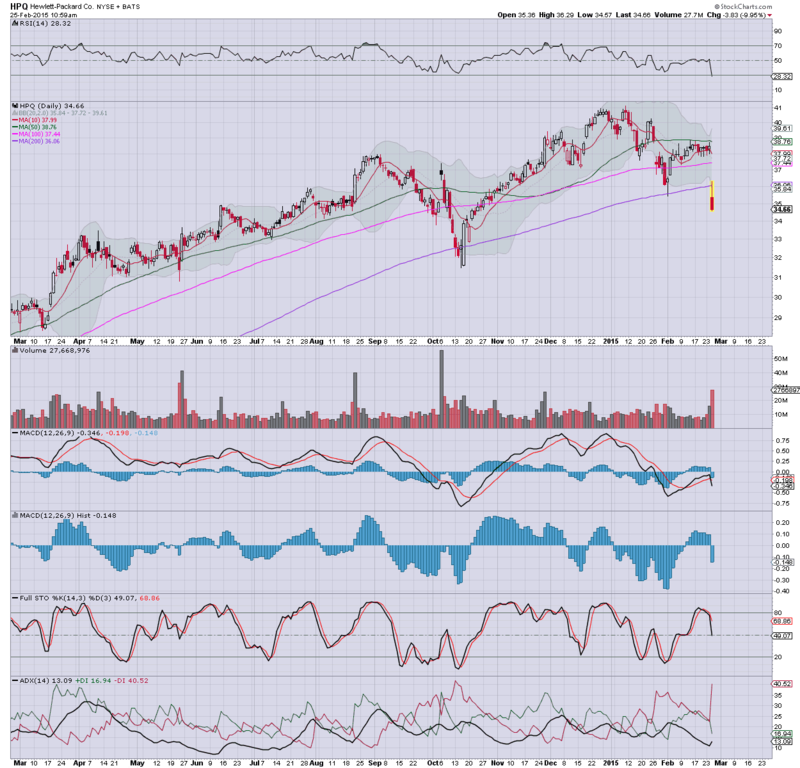 ... a loss of the key 200dma, as Mr Market mulls the longer term outlook for one of the 'once great' tech giants. US equities open a little lower, but until we're back under sp'2100.. it is nothing for the equity bears to even get moderately excited about. Yellen is set to address the US congress for the next 2-3 hrs, and Mr Market will be closely listening. Gold opens +$4, but looks set to turn red. Oil is similarly losing early gains. ... so... here we go again.... another few hours of the CEO of Print central. Time for a valium, wine.. or something. CHK, -10% on lousy earnings. 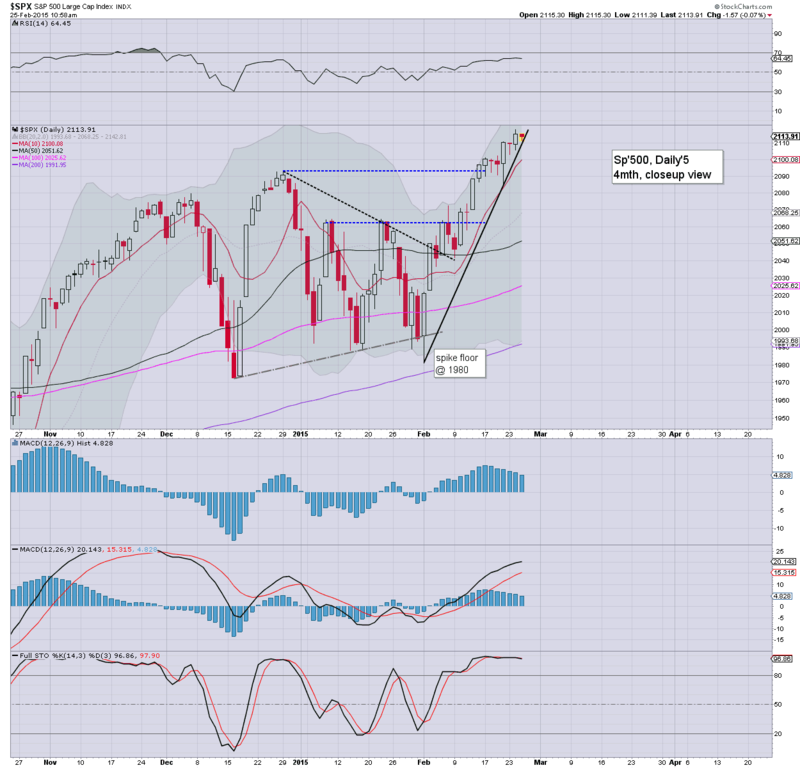 Seen on the bigger weekly chart... downside target zone remains 12/10.. by mid/late summer. 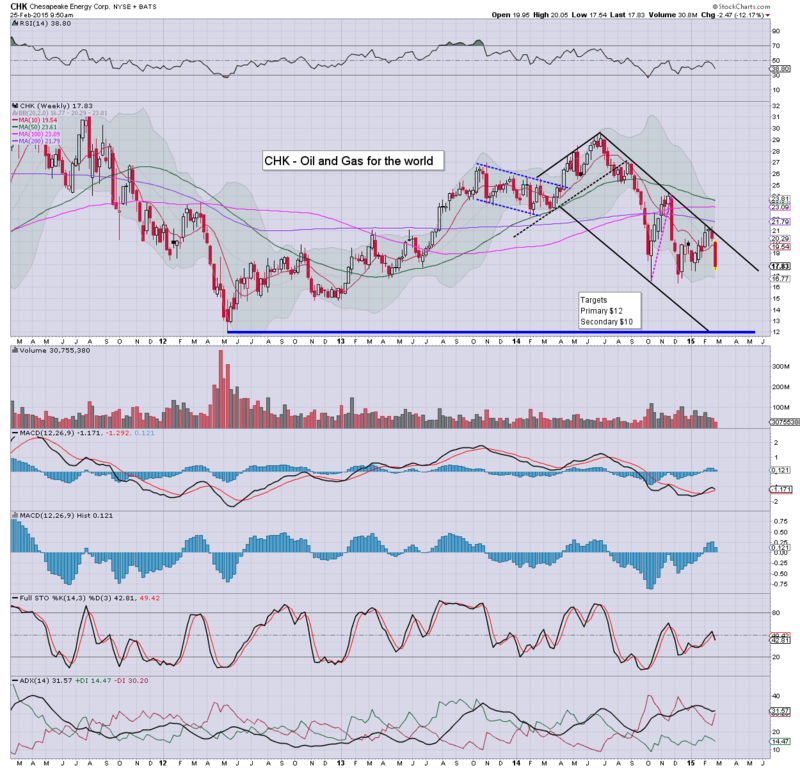 I am a fan of the company.. but there looks to be very viable downside of a further 35/45%. *the late summer looks to be 'shopping cart time' for a great many of the commodity related stocks (for those that think we rally in a hyper-bubble into 2017 or so). 10.36am.. Is it me.. or is Yellen starting to get annoyed? VIX has been smacked lower... despite minor equity declines... to the 12s. Train wreck TV. The film 'still alice' comes to mind. Good morning. Futures are fractionally lower, sp -1pt, we're set to open at 2114. Metals are holding moderate gains, Gold +$8. Oil is +0.9%. Yellen is set to offer more monetary spiel to the political class this morning at 10am. Mr Market will be listening to Yellen to speak to the US congress at 10am. 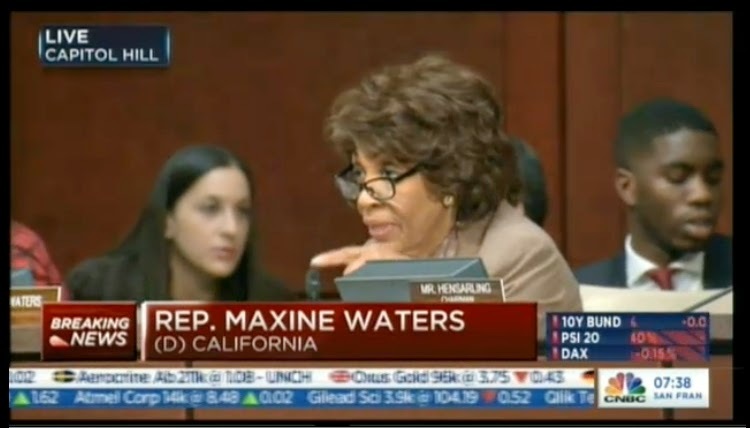 The testimony will be the exact same... but the questions will probably be more mediocre and bizarre (not least from Maxine Waters). As ever... make of that... what you will. 9.10am. Watching HPQ CEO Whitman on CNBC.... worse corporate leader (or should that be raider?) in modern history? Market is not buying her nonsense talk.... HPQ -6.4%.. after earnings. 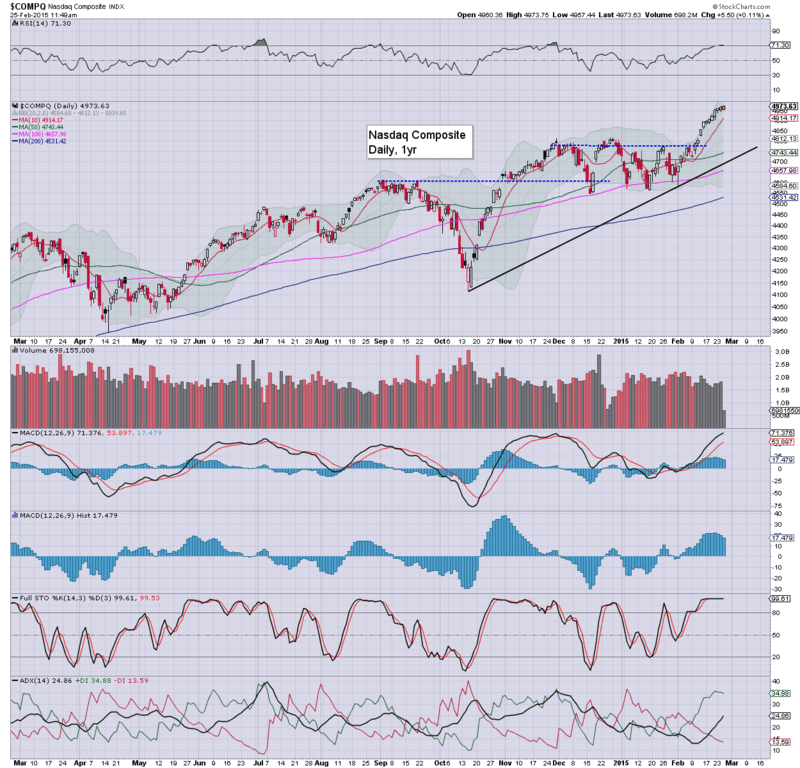 US equities saw another day of new highs, sp +5pts @ 2115. The two leaders - Trans/R2K, settled higher by 0.4% and 0.2% respectively. Near term outlook offers a retrace to the 50dma in the sp'2050s, but current price action does not suggest such a wave has even begun. *the Nasdaq Comp' is within 1% of hitting the giant psy' level of 5k. 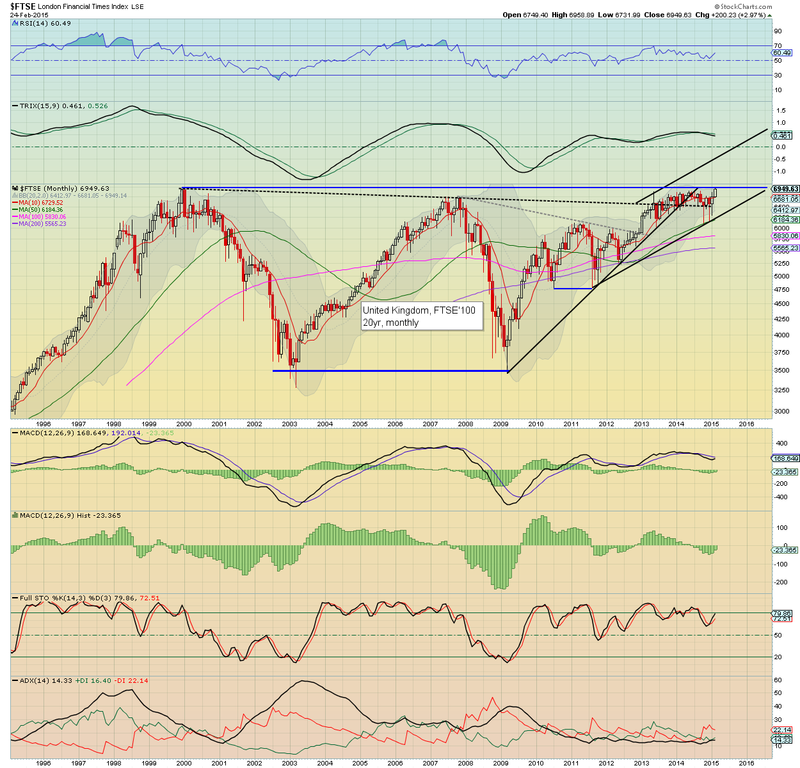 The March'2000 bubble high of 5132 is now within range for March.... although more likely April. So.. another set of new highs for the US equity market... and market appears in classic algo-bot melt mode. This could easily continue for some weeks. The only aspects that argue against that are a few individual stock charts (such as AAPL) that are clearly over-stretched... along with the R2K. UK - FTSE... new high. As I have been droning on about for many months... the UK market looked set to finally break the Dec 1999 high of 6950... today... it did that... with an intra high of 6958. 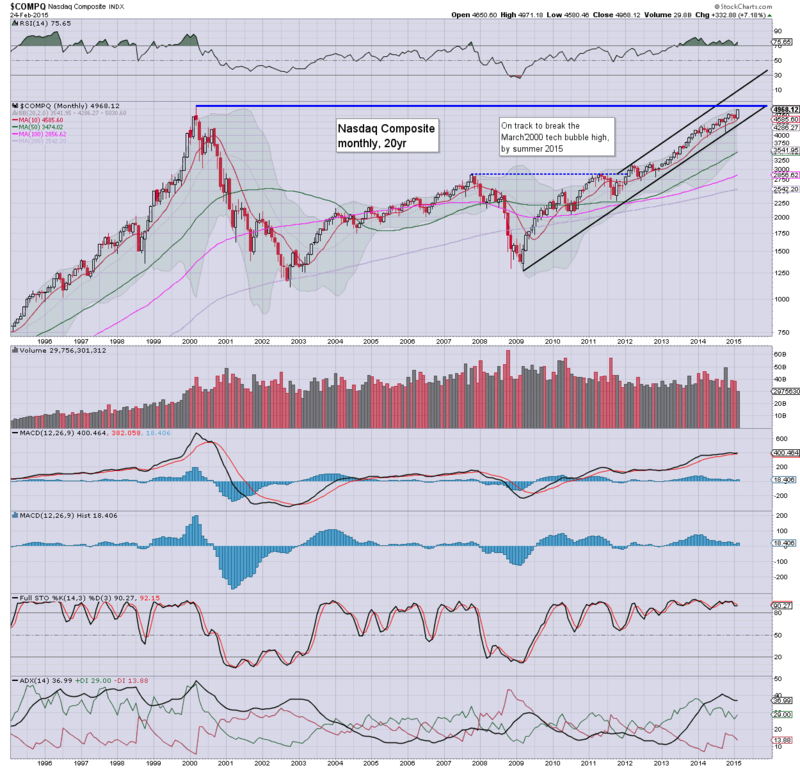 For me, a monthly close in the 7000s will offer a straight run to 8500/9k before year end. The giant 10k threshold looks viable by spring 2016. Wed' will be day'2 of the Yellen, this time addressing the US congress. Data of note: New home sales, EIA oil report.